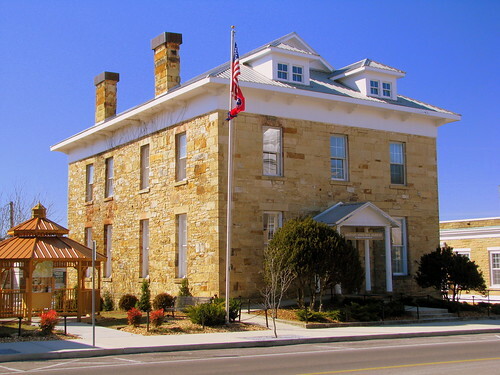 Located at the Bedford County Courthouse in Shelbyville, TN. 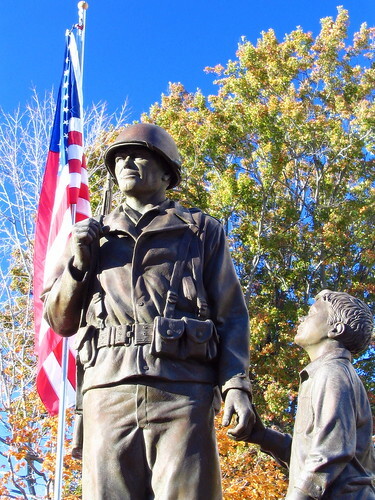 This statue was dedicated on Mar. 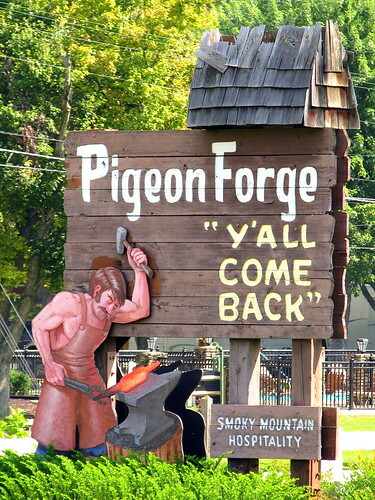 11, 2006 and was sculpted by Russ Faxon of Bell Buckle, TN. There are 1,111 bricks honoring donors of the project. There are 4 benches, one at each corner, to represent the 4 continents that the Bedford County Veterans have fought in. 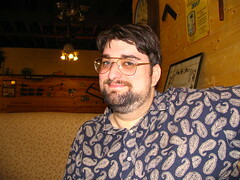 Hohenwald was settled by German immigrants. The name translates to "High Forest." 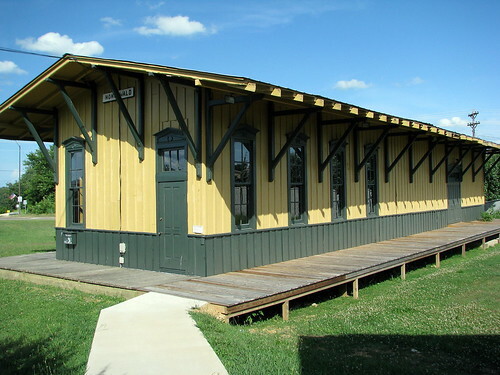 The original 1896 NC&StL Hohenwald Depot has been restored to its original appearance. As one of the first buildings constructed in the town, the Depot welcomed the new settlers. Later, it witnessed visits from Thomas Edison (coming to the region to find Cobalt) and William Wrigley, as well as served as a work site for German prisoners of war from Rommel’s African Corps during WWII. 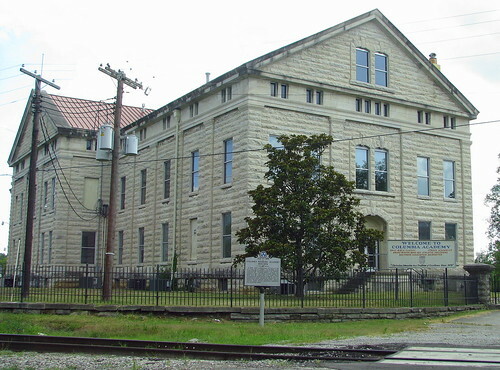 This Depot was moved several times over the years but returned to its original location and restored in 1985. This sign is inside the old Roane County Courthouse of Kingston, TN, which is now a museum. 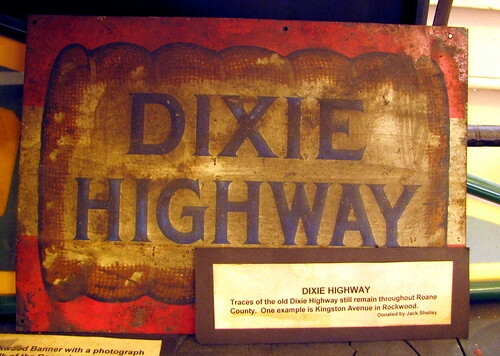 If you are not familiar with the Dixie Highway, it was a National Auto Trail (which predated the US numbered highway system) and connected Miami with the north. 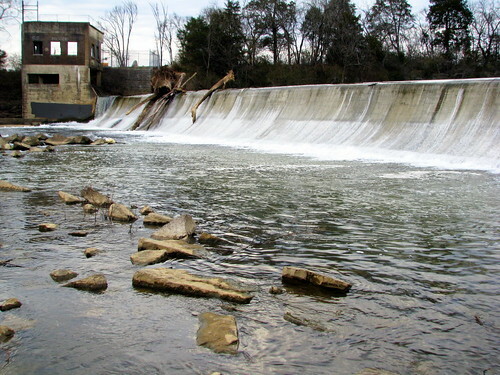 A portion of the highway passed through Roane County. This sign is probably about 80 years old. 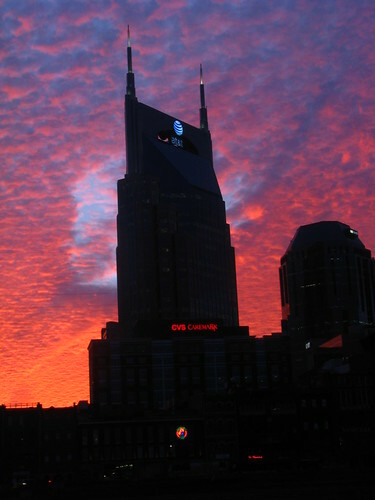 As of the beginning of 2008, Nashville's most prominent skyscraper, the Bellsouth Building has been renamed and re-logoed the AT&T building. With the two spires at top, it has been locally dubbed as the Batbuilding. Maybe I'll call it the Bat&tbuilding. Unless the Signature Tower gets built, this is Nashville's tallest skyscraper at 617 ft and 33 floors. It was built in 1994. Another logo in this view has changed about the same time. The Red CVS Caremark was just a white Caremark, and that change was made in late 2007. 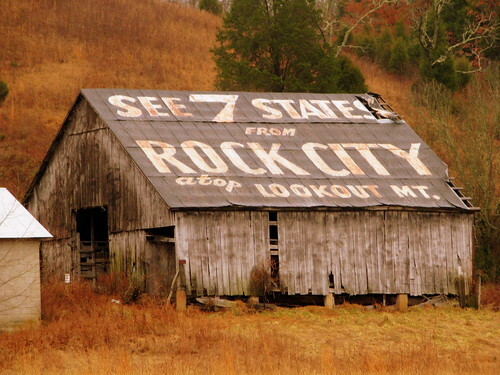 See 7 States from Rock City - US70 in Humphreys Co. This Rock City barn is located along highway U.S. 70 (Broadway of America) a couple of miles east of McEwen, TN in Humphrey's County. This message was written for the eastbound passngers to see. This barn was built in 1925 and belongs to the Holloran family farm. I saw a photo of this barn taken in 1995 and there was another faded ad on the front of the barn which you can't even see now and was very faded in that photo from 15 years ago. It looks like it spelled ORELISKET, so your guess is as good as mine. 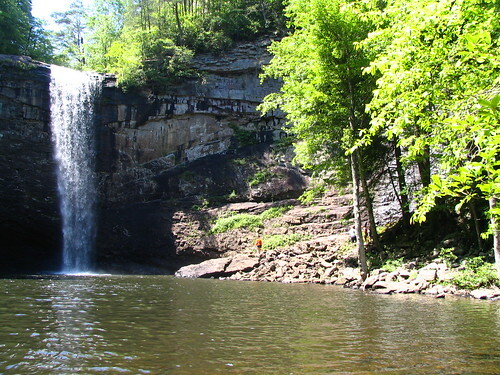 Foster Falls is a 60 ft. Waterfall and is part of the South Cumberland State Park in Marion Co., TN. The entrance is located right off highway US41 between Tracy City and Jasper in the Monteagle area. For perspective, my wife is wearing an orange shirt and is on the rocks to the right. The area is open from April to Nov and swimming in the lagoon is permitted. This sign has apparently been there for a long time, but I had never noticed it until I found a post card for it. 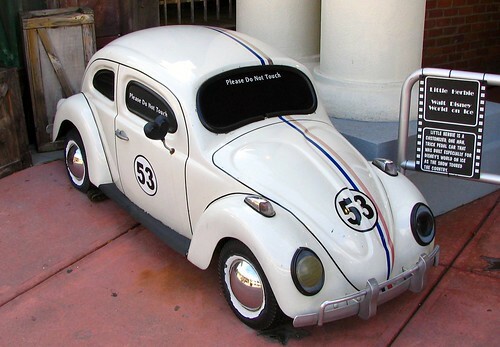 Then, I kept my eyes open for it all over town, only to find it on the main parkway at the Gatlinburg side. Jail door not keeping anyone in. 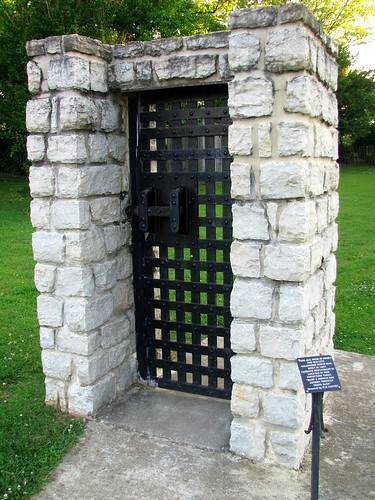 This jail door now stands in Fayetteville's stone bridge park. According to the marker, this jail door is from the old city Calaboose which was built in 1867. Cahoots Restaurant is located in this structure today (where you can eat in a jail cell.) According to the marker, "Many a person has looked through these bars." 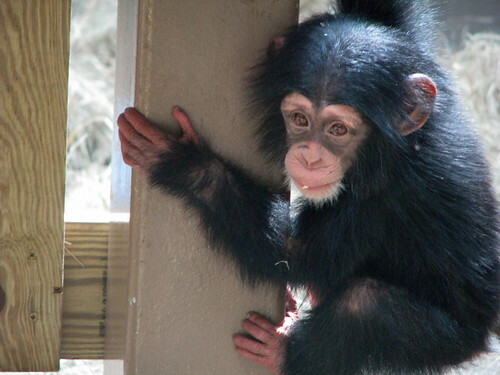 One of the cutest things about the baby chimp is he had his own stuffed toy chimpanzee that he carried around with him often. 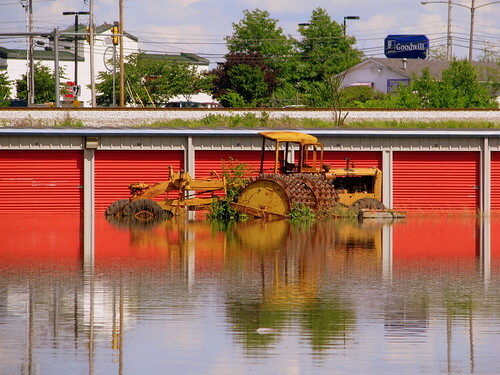 After the big Nashville Flood, people in the Bellevue area were invited to bring their flood-damaged possessions to Warner Park where it could be hauled away. Most of the photos on this blog were taken by me, However, this photo was taken by my mom on 5/12. Luckily nobody in our family suffered any flood damage. 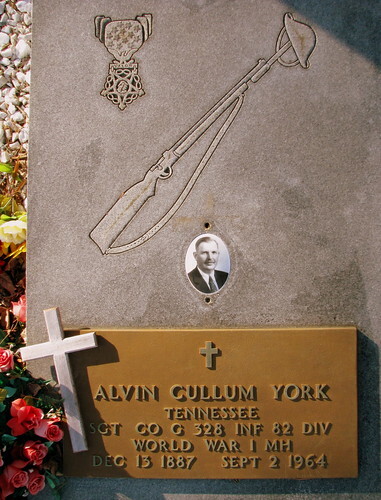 Yesterday, I posted a picture of the similar statue in Nashville. This statue is on the other side of Pennsylvania Ave, across from the White House. 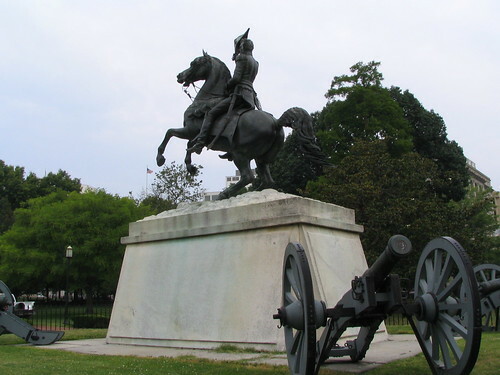 The cast metal part of the statue is the same, but the bases are different, as the one in Nashville has the name JACKSON in large letters at the base, and this one is surrounded by cannons. 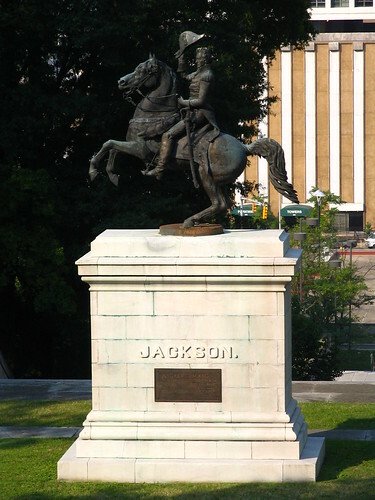 There are three of these President Jackson Statues in the US. This one is on the East side of the Tennessee Capitol on capitol hill. Another one is "across the street" from the White House in Washington DC. The third is in New Orleans. I had never seen that one, until President Bush spoke on TV in front of it in his Post-Katrina speech. Tomorrow, I'll post the picture of the statue in Washington. Those in Nashville and Middle TN who like to fly model airplanes can do so at a model runway at Cane Ridge park on the south side of Davidson County. This is the sign there at the entrance. On the other side is the board where the enthusiests reserve their plane's frequency. If you look closely, there's an actual propeller on the front of the plane. Mr. W. H. Magness, Jr. (1865-1936) was a co-founder and the first president of the National Bank of McMinnville in 1874, which became First National Bank in 1905. He was the city's foremost philanthropist, and donated the land and construction cost for this classic and dignified cut-stone building. It was built in 1931 at a cost of $40,000, and is named in honor of the father and brother of Mr. Magness. His other charitable gifts included the construction of the carillon tower of Magness Memorial Baptist Church at 403 North Spring Street. That building burned after his death, and was rebuilt as First Baptist Church. Mr. Magness is buried in Riverside Cemetery. Mrs. J. M. Cunningham was the local champion of reading and headed the library from 1913 until her death in 1954. 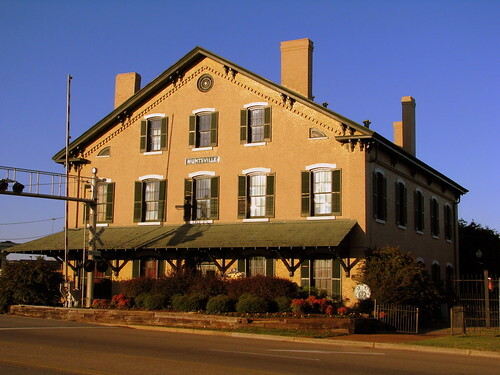 The Depot served as division headquarters and passenger station on the Memphis and Charleston Railroad. The line is now part of Norfolk Southern Railroad. The last passenger train came in on March 30, 1968. The depot is listed ont eh National Register of Historic Places, and looks to be an impressive museum (although I was unable to see the inside.) It is part of the EarlyWorks system, along with Constitution Village. It carries US70 over center hill lake. 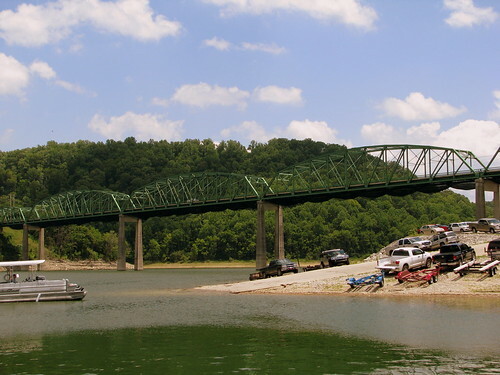 This bridge was made necessary by the formation of Center Hill Lake in the late 40's. Old highway 26 crossed this spot when it was just a river, and I have heard that the old span is still down there, below the water. Picture taken from the Sligo Marina. This sign is listed on the National Register of Historic Places. 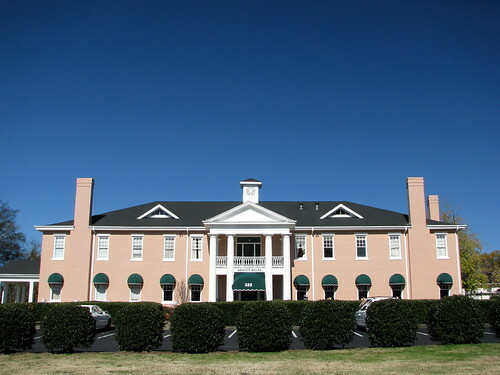 Has been "Columbia Academy" (without Military) since 1979. 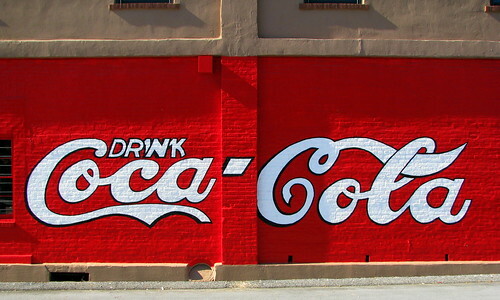 Located at the important location of 7th St. (U.S. 412) at the train tracks. On the National Register of Historic Places, built in a Colonial Revival and Romanesque style. In 1888, local residents gave 67 acres to the U.S. Army for an arsenal. The Bowling Green stone buildings quartered troops in the Spanish-American War. Columbia Military Academy was founded in 1904 and opened formally August 23, 1905 with 167 young men from eight states. Designated an "Honor School" in 1935 by the U.S. Government, youth nationwide trained here as military and civil leaders, among them: general officers, battle heroes, governors, educators, and corporate heads. 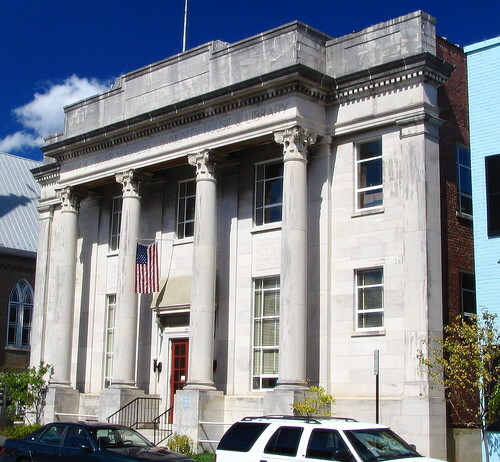 The "New" Courthouse (inasmuch as you can call a 1905 building new) is across Main Street from this building. This was built in 1886 and much of the inside was destroyed by fire in 1905. It was restored and used as a school for a while. 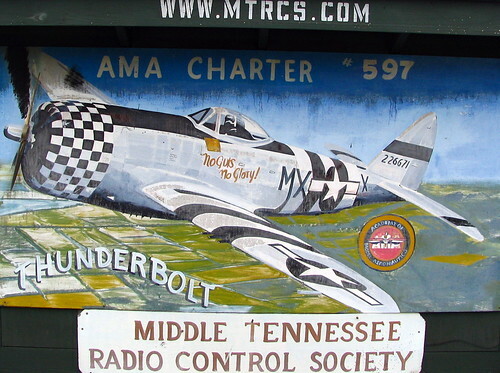 Now it is home to the Military Memorial Museum of Upper Cumberland. I recently watched a documentary on the history of Rutherford County. 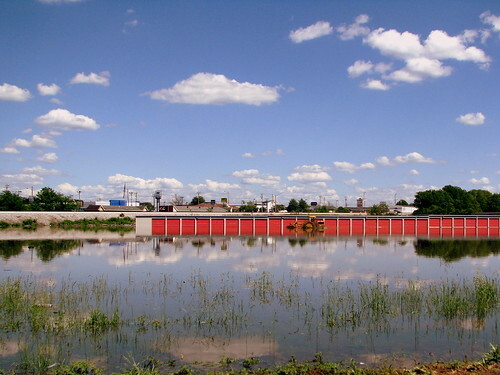 The first county seat was the now underwater town of Jefferson. County officials wanted to move the county seat to a better location. Murfreesboro was ulitmately chosen, but Mr. Ready wanted his town of Readyville to be the new county seat (presumably so he could make a lot of money selling a lot of his land in the area.) 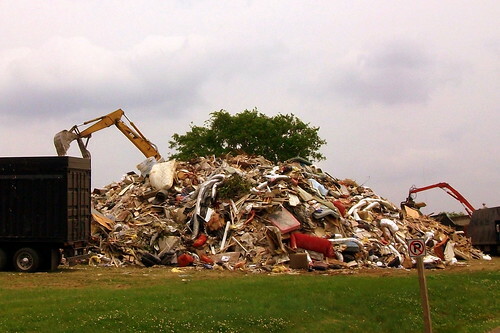 After Murfreesboro was chosen, Mr.Charles Ready continued to throw a fit about Readyville not being chosen. 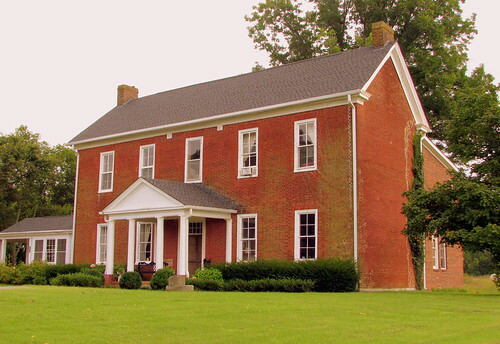 Soon afterward, when it was necessary to create the border between Rutherford and Cannon counties, Officials made sure the border went through Mr. Ready's house and mill so that he'd have to pay taxes in both counties. From this vantage point, the East side on the left is cannon County and the right west side is Rutherford. Eventually, Charles Ready became a U.S. Congressman. OK, so there were a lot of photo opportunities to get out and see the devastation or the high water levels downtown. However, I decided to stay at home this week and not get in anybody's way. Most of my postings here are usually done in advance, but a couple of my recent posts seem to be flood related, specifically last Saturday with a kayaker. In the foreground you can see a sidewalk underwater also. The colors on this ride make it the prettiest ferris wheel I have seen. 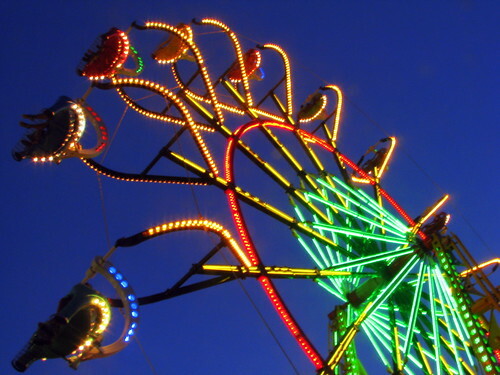 It was developed in the 1960's for the Seattle World's Fair and now days one comes every year to the Williamson County Fair every August. One thing that sets it apart from a typical Ferris Wheel is the speed at which it spins, providing a free-fall sensation. 601 Main St., Listed on the National Register of Historical Places. Classical Revival architecture. 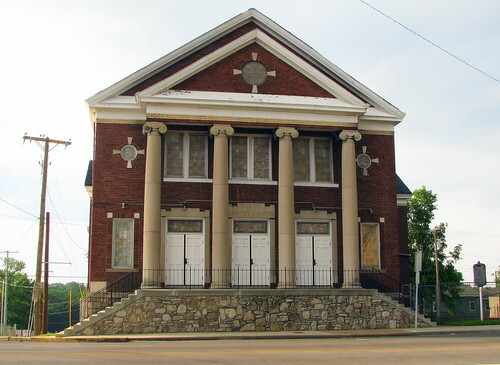 The church building was built in 1928 on the corner of Main and Sixth streets. 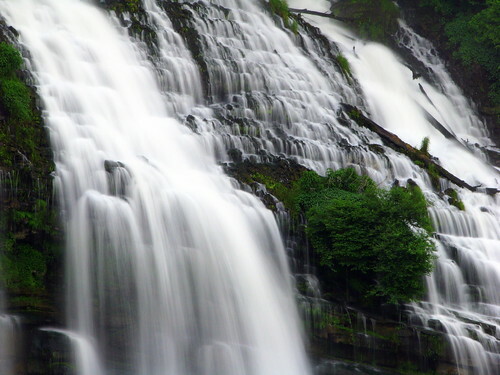 It was expanded in 1931 and continuously improved, especially from 1934 through 1941. The front entrance of the church was restructured because of the widening of Main Street during the 1960s. Built in a Classical Revival design, this beautiful church building contains a magnificent pipe organ, melodic chimes, a mural by Tennessee State University professor and artist Frances Thompson, and memorial windows. I wonder how many times I've driven past this and not realized it was here, right off of US231 north of Murfreesboro, where the highway crosses over the Stones River. 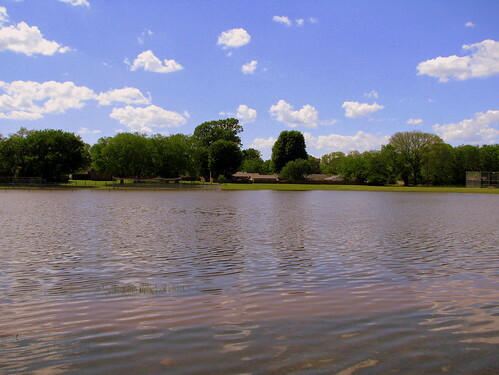 The area is listed as Walter Hill Day Use Park. I just learned there's a designated State Natural Area close to here, because there's a rare plant that only grows here called the Stones River Bladderpod. The most noticable feature of this Greek Revival mansion is the monumental pedimented portico. The central original part of the building was built in the 1830s as a female academy. Later, it was turned into a private residence and the portico was added. When Austin Hewitt died in 1921, he willed his estate to become a ladies retirement home, and was then enlarged. Everything at the Chattanooga downtown riverfront near the Aquarium has changed over the last few years, prompting a tourist slogan of ChattaNEWga for a while. One of these changes is stairsteps that lead down to the Tennessee River and large spray fountains that shoot into the river. It is apparently a popular place to get in your kayak and go through, which a family of four was doing on this afternoon. 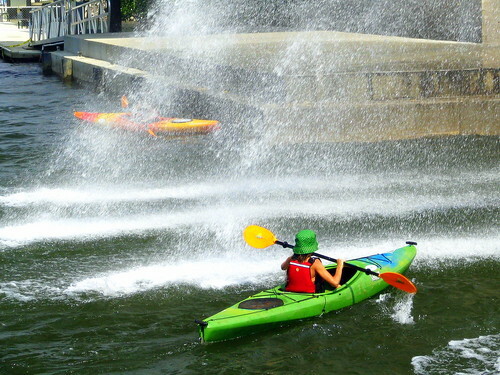 The daughter in the green kayak is about to go through and the son in the yellow kayak just did.